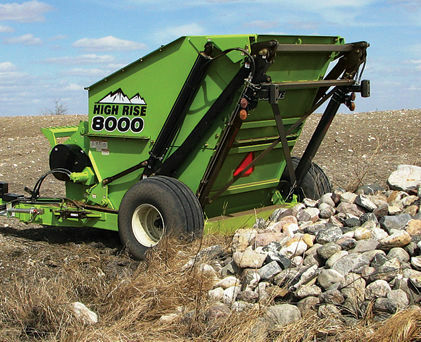 8' dump height with super large 3 cubic yard hopper so you can spend more time picking and less time running to the dump site. 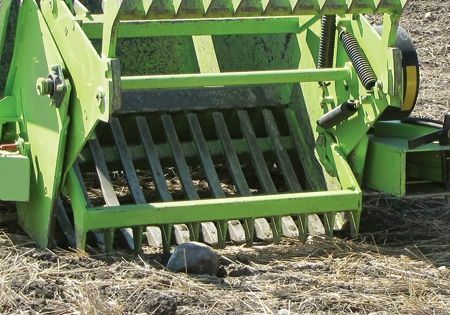 Durable tapered T-iron grate with 38 mm (1 1/2") thick teeth eliminates jamming while allowing soil to sift through for clean rock picking. Batt tubing has 10 mm (3/8") thick walls with wrap around, hard surfaced batt teeth for greater strength and wear resistance. 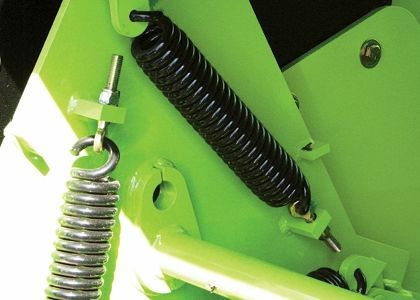 Large, heavy wire springs hold batts firmly in position and cushion shock loads. 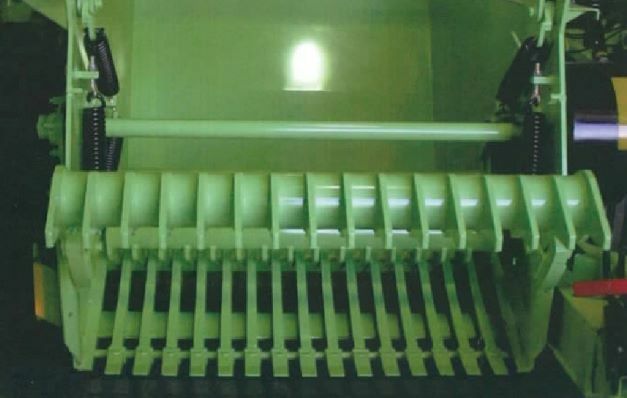 Spring coil diameter is reduced at the ends to minimize the possibility of breaking the spring hooks. 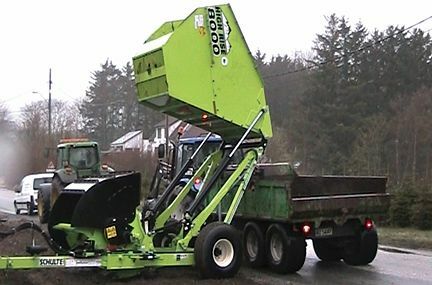 Optional hydraulic pivoting hitch pole allows the machine to be quickly moved from the offset picking position to a centred transport position. 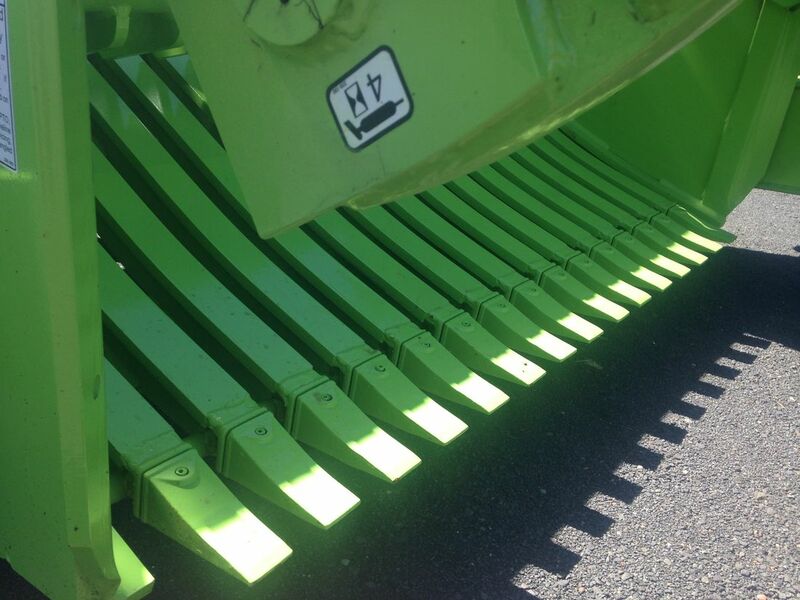 Large 16.5L X 16.1 10 ply tires provide superior flotation. Flow Control - a 0-56.8 L/m (0-15 GPM) flow control valve helps to control the reel speed. 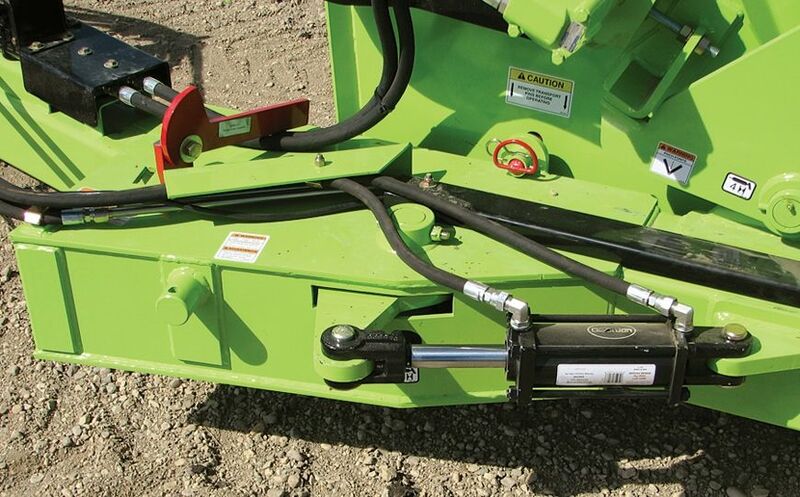 This option is useful on tractor models where hydraulic flow is not adjustable. 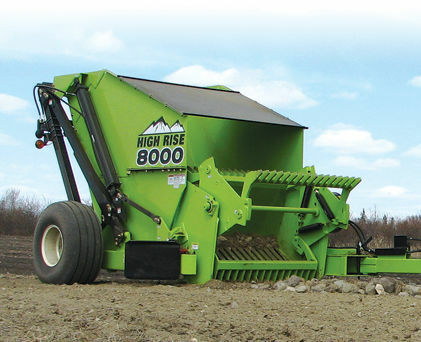 The Schulte High Rise 8000 is hydraulically driven using a rugged Char-Lynn 2000 series hydraulic motor in combination with a flow control valve for reel speed adjustment and a crossover relief valve to cushion shock loads. Grated hopper bottom helps sift out as much dirt as possible. Three batt reel with high trip clearance provides superior performance in large rocks. These two videos were shot during a start up of a High Rise 8000 Contractor model in 2018. As part of our normal delivery service, we connect the machine to the owner's tractor and teach them how to operate the machine. David is using his High Rise 8000 for the first time, picking up smaller loads while he gets comfortable with the way the machine operates.